Direct response radio advertising, at its core, fulfills the same business need regardless of what type of business you are in. That business need is customer acquisition. Whether you own a direct-to-consumer model business, a retail business, a Web business, or some combination thereof, you need to acquire new customers if you want to grow. Even if you don't want to grow, you need to acquire new customers to replace the ones you're losing through ordinary attrition. Throw out all you think you know about advertising, radio advertising, and direct response advertising. It's best to begin with a big, clean whiteboard. Once your mind is clear, we want you to think about the following concepts as the backdrop for the rest of the book. 1. What is Direct Response? The first concept one must understand is that of "direct response." We can understand direct response in two ways. First we can define it: Direct response advertising is a form of advertising that is designed to elicit a response that can be measured in such a way as to provide a concrete and swift evaluation of its effectiveness. Direct response advertising is measurable and accountable for generating data that will demonstrate its effectiveness. The other way to understand direct response advertising is to contrast it with other approaches to advertising. In the direct response world, we often refer to "brand" advertising as a form of advertising designed primarily to influence memory recall of a product, service, or "brand," and often to associate that product or service with some positive emotion. Brand advertising is not designed to be related directly to sales on any kind of granular level. Rather, it is typically held accountable for producing results in terms of "awareness," "recall" (aided or unaided), and sometimes "intent to buy." In direct response radio, your ad contains a call to action with a specific tracking mechanism. Often, this tracking mechanism is a "call now" prompt with a toll-free phone number or a unique Web URL. With direct response, you track the results of your ad in terms of calls, orders, customers, leads, sales, revenue, and profits that result from the airing of those ads. Then you compare the revenue you received to the cost to air that ad and you determine whether the effort resulted in profit (revenue - costs = profit). You do more of what "works" (profit) and no more of what doesn't work (no profit). To be clear, we are not saying that one way (brand or direct response) is better than another. Each has its own merits, and shortcomings. Further, direct response advertising does not advocate against, nor abdicate any responsibility for, building a brand. Rather, direct response campaigns are designed to build a brand in a measurable, accountable way. 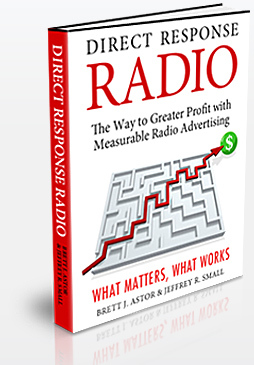 Evidence abounds that direct response radio builds admired brands. GEICO is a brand that has been built through direct response radio advertising. As is Proactiv Solutions. And Quicken Home Loans. The list goes on. Think of radio advertising as a 5,000-lane highway from your business to groups-station audiences-of your po­tential customers. T he many lanes on this highway are the many different radio stations and radio networks that are available for you to air your radio advertisement on. You send your message to your potential customers on these "lanes." The lanes are clustered in such a way that they reach groups-collections of customers-with similar tastes and demographic profiles. Therefore, some of these lanes lead to groups that have a high concentration of people who match your target customer profile. These are the lanes you want to develop a strategy for dominating and protecting from competitive intrusion, as they can provide you a stream of new profits. Holding costs equal, advertising on lanes with a high con­centration of your potential customers is more profitable than advertising on lanes with a lower concentration of your target customer profile. The groupings of lanes are the radio formats, which are used in radio advertising to en­hance the efficiency of, or return on, advertising dollars.